evian has brought back the Evian Babies in a new integrated advertising campaign, Live Young, reasserting a vision of youth as a positive, universal value that each one of us shares. 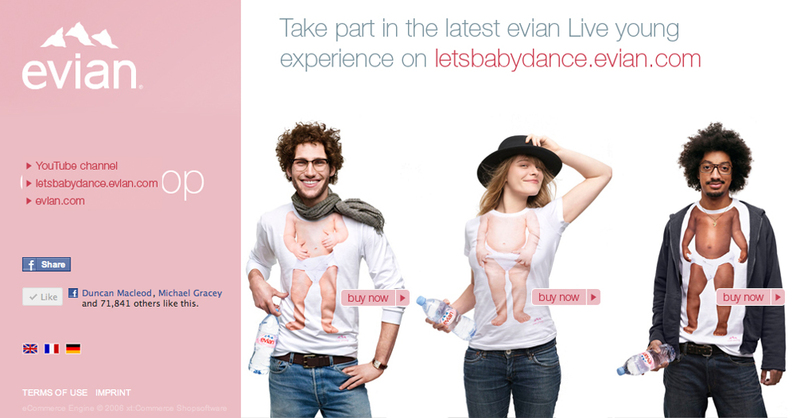 The campaign follows on from the success of the Roller Babies TV campaign, and evian Baby Inside print campaign, this time inviting fans to enter into an immersive brand experience, with a film, interactive music video and campaign t-shirt. The stop-motion film is based on the simple principle of the flipbooks from our childhood. 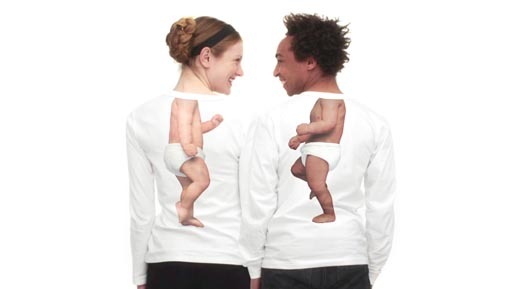 Men and women, wearing a T-shirt printed with babiesin different poses, appear one by one to the beat of the music, creating the illusion that the babies are dancing. An interactive music video, Let’s Baby Dance, accessible both online at letsbabydance.evian.com and as an iPhone app, invites users into the Live young universe, where with just a few clicks they can become actors in the video and see “their own baby,” or their friends’ babies, dance to the music just like Michael Jackson or James Brown! Maybe, if they all work together, they can create the world’s longest music video. There will also be opportunities to participate in the clip during major sporting events: Evian Masters, Wimbledon, US Open, Australian Open. By popular demand among Internet users after the print campaign was released, and after an exclusive release at the legendary Paris concept store Colette in 2010, the baby inside T-shirt will be for sale worldwide. 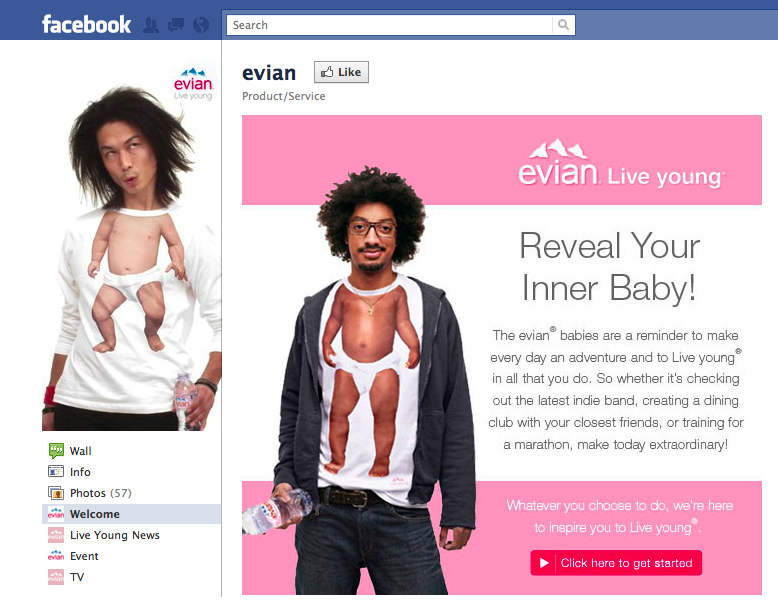 The 3 different models, Nicolas, Ornella and Fred, are available at shop.evian.com (unit sale price: €30). The Live Young campaign was developed at BETC Euro RSCG, Paris, by creative director Rémi Babinet, art director Agnès Cavard, copywriter Valérie Chidlovsky, assistant art director Gregory Ferembach, music producer Christophe Cauret, media strategy manager Martine Picard, account supervisors Marielle Durandet, Dominique Verot, Gaëlle Gicqueau, Isabelle Picot and Antoine Clemenceau working with evian staff Michael Aidan, Cécile Turkel, Florence Bossard, Frédéric Guichard, Tom Pullen and Elsa de Guzman. Digital components were produced at BETC Digital by agency supervisors Stéphanie Mayer, Florian Cuminal, Julien Chaillou and Guillaume Audureau, creative director Ivan Beczkowski and art director David Tamayo. Digital components were produced at Grouek and Touaregs, Paris. The iPhone app was developed at userADgents, Paris. Filming was shot by directors collective Legs at Milk Studios, via Wanda Productions with producer Fabrice Brovelli. The core members of LEGS are Adam Joseph, Geremy Jasper, Georgie Greville and Greg Brunkalla. Music is “Wordy Rappinghood,” Uffie (produced by DJ Mehdi) and “Rapper’s Delight,” Dan the Automator.